Background\Aim: Quadruple daily administration of proton-pump inhibitor (PPI) therapy achieves potent acid inhibition, and combined with amoxicillin, with its pharmacodynamic and pharmacokinetic characteristics, may be efficient for Helicobacter pylori eradication. We compared the efficacy of two optimized high-dose dual therapies with a bismuth-containing quadruple regimen for treating H. pylori infection. Rabeprazole dosages for H. pylori eradication were also evaluated. Patients and Methods: Treatment-naive and H. pylori-positive subjects were recruited and randomly apportioned to three treatment groups: Group A (n = 87), rabeprazole 10 mg plus amoxicillin 750 mg (4 times/day for 14 days); Group B (n = 87), rabeprazole 20 mg plus amoxicillin 750 mg (4 times/day for 14 days); and Group C (n = 89), bismuth-containing quadruple regimen consisting of rabeprazole 20 mg, bismuth 220 mg, amoxicillin 1000 mg, and clarithromycin 500 mg (2 times/day for 14 days). Four weeks after treatment discontinuation, patients were examined for H. pylori infection by 13C-urea breath test. The rates of adverse effects, compliance, and eradication were evaluated. Results: Eradication rates in groups A, B, and C were 78.1, 81.6, and 84.3%, respectively, based on intention-to-treat analysis, or 79.1, 83.5, and 86.2%, according to per-protocol analysis. Rates of adverse events and compliance of the three groups were similar. Conclusion: For treating H. pylori infection, optimized high-dose amoxicillin–PPI dual therapies failed to achieve high cure rates in China and held no advantage over a bismuth-containing quadruple regimen. Helicobacter pylori (H. pylori) is a gram-negative, microaerophilic, and spiral-shaped pathogenic bacterium that was initially described in chronic gastritis patients by Marshall and Warren in 1983. The multiplication of H. pylori in gastric mucosa causes inflammation and gastric mucosal damage that result in gastrointestinal diseases, and even extra-gastrointestinal diseases such as iron deficiency anemia, urticaria, and some cardiovascular diseases.,,, Multicenter studies in China showed that resistance rates of H. pylori to metronidazole, clarithromycin, and amoxicillin were 75.65, 27.6, and 2.7%, respectively, and the dual resistance rate to metronidazole and clarithromycin was 42.1%., Thus, the eradication rates of traditional triple therapy have decreased significantly in most regions, even to the unacceptable level of <80%. Other alternative therapies, such as sequential and combination therapies, are designed to raise eradication rates by increasing the number of antibiotic types (three or four), but the effects are not clear, and these are accompanied by many adverse reactions. The increased use of antibiotics also reduces rescue therapy options when first-line treatment fails. Proton-pump inhibitors (PPIs), a group of drugs that reduce gastric acid, may increase the activity and stability of antibiotics by elevating gastric pH and influencing the growth of H. pylori. Thus the degree and duration of acid suppression are linked to the cure rate. Studies regarding the association between intragastric acidity and the success of H. pylori eradication indicated that a pH > 4 should be sustained for throughout 24 h and 24 h-pH > 6.0.,, However, standard PPI therapy (qd or bid) often fails to maintain a long-term increase in intragastric pH > 4.0., Increasing the eradication rate requires more frequent and higher doses of PPIs. Research by Sugimoto et al.,, suggest that quadruple daily administration of PPI therapy inhibits acid secretion within 24 h, irrespective of CYP2C19 (cytochrome P450 family 2 subfamily C member 19) genotype., Further, amoxicillin, a β-lactam antibiotic, has been widely used in the eradication of H. pylori, and the rates of primary or acquired resistance are low.,, The antibiotic effects of amoxicillin are time- and pH-dependent., Four times daily administration can exert maximum bactericidal action, which is in accord with the fact that time is the most important pharmacodynamic parameter in β-lactam antibiotic dosage. In a setting of high drug resistance, bismuth-containing quadruple therapy has attracted widespread attention for first-line or rescue treatment in China. However, there are also many limitations, such as multiple drug combinations, complicated protocol, high cost, adverse side effects, and poor patient compliance., Recently, Yang et al. reported that a high-dose dual therapy consisting of amoxicillin and rabeprazole achieved an eradication rate of 95.3% in first-line therapy, and 89.3% in rescue therapy. This observation provides a new strategy for H. pylori treatment in China and other developing countries, where antibiotic resistance against H. pylori is high. Thus, we conducted this study to evaluate the efficacy of a dual therapy consisting of rabeprazole and amoxicillin to treat H. pylori infection, relative to that of a bismuth-containing quadruple regimen. We also explored the reasonable dosage for a PPI, for the purpose of determining an optimized therapeutic regimen for H. pylori treatment in China. This randomized, open-label pilot study was conducted in local hospitals. The Research Ethics Committee of the local university approved the study, and registered it as ChiCTR-IOR-15007306. Patients who received a diagnosis of chronic gastritis and uncomplicated peptic ulcer by endoscopy were recruited (n = 263 subjects, aged 18–70 years). All subjects provided written informed consent. Patients with the following were excluded: treatment history of H. pylori infection; previous gastric surgery; gastric mucosa with high-grade intraepithelial neoplasia; pregnant or lactating; alcoholism; some major systemic diseases; severe complications of peptic ulcer disease; allergy to any medication in the regimens of the study; participation in other drug studies in the previous 3 months; unable to complete the follow-up; or incompliance. In addition, patients taking antibiotics, bismuth, probiotics, H2 blockers, PPIs, nonsteroidal antiinflammatory drugs, or adrenal corticosteroids in the preceding 4 weeks were excluded from this study. Infection by H. pylori in the 263 patients was determined via carbon-13 (13 C) urea breath test, or rapid urease test, or H. pylori culture in solid selective, enriched medium. Each patient was randomly assigned to 1 of 3 treatment groups (R10A, R20A, or RBAC) based on a randomized digital table designed by Excel. Group R10A (n = 87), group R20A (n = 87), or group RBAC (n = 89) received 10 mg or 20 mg of rabeprazole plus 750 mg amoxicillin (R10A or R20A, respectively, each 4 times/day for 14 days), or a bismuth-containing quadruple regimen of 20 mg rabeprazole, 220 mg bismuth, 1000 mg amoxicillin, and 500 mg clarithromycin (RBAC; 2 times/day for 14 days) [Figure 1]. Drugs in dual-therapy regimens were taken before and after each meal, and the last time before going to bed. Drugs in the quadruple regimen were taken before and after breakfast and dinner. Figure 1: Flowchart of this study with eradication rate, AE, and adherence. Rabeprazole sodium enteric-coated capsules were purchased from Zhuhai Rundu Pharmaceutical, China. Amoxicillin was supplied by United Laboratories, China. The bismuth potassium citrate oral solution was made up in Daping Hospital. The clarithromycin tablets were purchased from Shanghai Abbott Laboratories, China. All patients were informed regarding the drug administration schedule and possible adverse effects such as taste disorder, or black discoloration of stool during bismuth use. Patients were also cautioned to avoid acidic foods, alcohol, and tobacco. They were also warned of the possibility of serious unbearable side effects that could cause termination of therapy, and the way to report an adverse reaction. Patients were given written instructions regarding use of the medications. PPI and bismuth were administrated half an hour before meals and antibiotics after meals. A follow-up phone call was performed after the first and tenth day of treatment. Four weeks after the completion of therapy, each patient was examined for H. pylori eradication by 13C-UBT. The sample size for multiple sample rates was calculated based on the assumption that the eradication rates would be 76 and 95.3% in the high-dose dual therapy and bismuth-containing quadruple regimens, respectively., Thus, we estimated that 263 subjects were required for this study of three groups, with a power of 90% at a 5% statistically significant level, and assuming a ~20% dropout rate. Statistical Package for the Social Sciences Statistics for Windows version 17.0 was used for data analysis. A P value <0.05 was regarded as statistically significant. The eradication rates and 95% confidence interval (CI) were calculated via intention-to-treat and per-protocol analyses. The Chi-squared test was used to assess variance in the eradication rates and side effects. Potential associations between the therapy regimens and characteristics of patients were analyzed by χ2 test. These characteristics included: gender; lifestyle; educational level; endoscopic diagnosis; family member information (such as living region and number of family members); and compliance. One-way analysis of variance was used to investigate associations between the respective therapies and age or body mass index. A total of 263 eligible subjects were recruited for this trial [Table 1]. Patient compliance was defined as the completion of at least 80% of the drugs. Five patients were excluded due to withdrawal of consent, loss to follow-up, or poor adherence (1, 2, and 3 from groups R10A, R20A, and RBAC, respectively). The three groups were comparable with regard to gender, age, body mass index, number of family members, lifestyle habits, and clinical data. Regarding rates of eradication of H. pylori, the intention-to-treat analysis showed no significant difference among the groups (P = 0.580) [Table 2]. Based on a per-protocol analysis, there was no significant difference in eradication rates (P = 0.452). Notably, by both methods of analysis, eradication was <85% in the R10A or R20A groups. Eradication was >85% only in the RBAC group (86.2%, 95% CI 75.6–91.4), according to the per-protocol analysis. These data indicated that the efficacy of the three regimes was very similar. 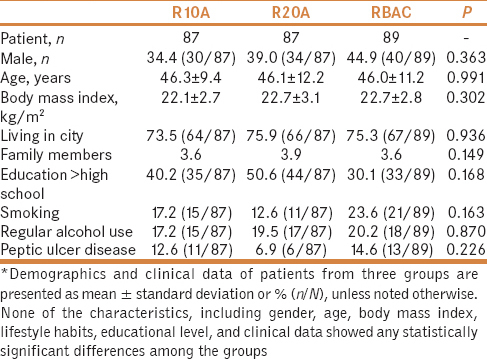 The occurrence of side effects such as parageusia and black teeth and black tongue tended to be higher in group RBAC than in groups R10A or R20A, although the difference was not significant [Table 3]. H. pylori infection was first identified as an infectious disease in the Kyoto global consensus report. It leads to chronic active gastritis, peptic ulcers, and gastric cancer. As in asymptomatic syphilis or tuberculosis, the rate of progression in asymptomatic H. pylori gastritis without complications is unpredictable. Eradication of H. pylori would reduce the reservoir of infected individuals, and avoid the associated costs of diagnosis and treatment of this and its related diseases. This pilot study evaluated the effects of two dual-therapy regimens (rabeprazole and amoxicillin) for active H. pylori infections relative to that of a bismuth-containing quadruple regimen (RBAC). A dual therapy consisting of a PPI and amoxicillin twice daily was first introduced in the 1990s as a first-line regimen against H. pylori infection. As the eradication rate was not satisfactory, it was subsequently used as a salvage treatment; the eradication rate of salvage therapy consisting of rabeprazole (10 mg 4 times/day) and amoxicillin (500 mg 4 times/day) could reach 90%. The above observation was in agreement with the study of Yang et al., who showed high eradication rates of H. pylori after high-dose dual therapies (rabeprazole 20 mg and amoxicillin 750 mg 4 times/day) in a multicenter randomized controlled trial. These results indicated that the key to a successful dual-therapy regimen is a PPI-generated neutral environment suitable for bacterial growth and entry into a replicative state of the dormant H. pylori residue, which makes H. pylori sensitive to amoxicillin. Amoxicillin administrated four times daily could maximize its antibiotic effects. Like other microorganisms, H. pylori could exist as persister cells after the therapy was completed. This nonreplicating state is described as phenotypic resistance, which requires an acidic environment., An increase in the dosage of rabeprazole can overcome the influence of a CYP2C19 gene polymorphism on gastric pH, suppress acid secretion, and provide a neural environment to transform the dormant H. pylori residue into a replicative state and susceptible to antibiotics. Our data showed that, according to the intention-to-treat analysis, a 14-day protocol with rabeprazole, 10 or 20 mg (R10A and R20A), and amoxicillin 750 mg four times daily achieved an H. pylori eradication rate of 78.1 or 81.6%, respectively, while the eradication rate of the bismuth-containing quadruple regimen (RBAC) was 84.3%. Compared with the RBAC group, the R10A and R20A groups were similar in terms of H. pylori treatment effects, and showed a lower eradication rate than the study of Yang et al. In the report by Yang et al., patients with extensive, intermediate, or poor metabolizers of the CYP2C19 gene accounted for 43.6, 43.6, and 12.8%, respectively, of the study population. In our previous studies from Chongqing, China,, these accounted for 44.4, 45.8, and 9.8% of the patients. The prevalence of amoxicillin resistance was 0–3.6% and 0% in Taiwan and Chongqing, respectively. In these two studies,, there were no differences in CYP2C19 gene polymorphism and the prevalence of amoxicillin resistance among the subjects. In the present intention-to-treat analysis, the clarithromycin-containing bismuth quadruple therapy delivered an 85% eradication rate. Another trial of bismuth quadruple therapy containing clarithromycin achieved better curative rates of eradication (88.8 and 94.9% based on intention-to-treat and per-protocol analyses, respectively). Resistance to clarithromycin influenced treatment efficacy: eradication rates of the clarithromycin-containing bismuth quadruple therapy with the clarithromycin susceptible strains were 98.6%, and 76.9% with resistant strains (P = 0.001). Sensitivity to clarithromycin may be a key factor in our research influencing the eradication regimen curative effect, but unfortunately a test of susceptibility to clarithromycin was not conducted. There are three main potential reasons that the results of the dual therapy of the present study were not as outstanding as previous reports. First, there was no information regarding intragastric pH values. A pH > 6 is essential to the success of dual therapy on H. pylori eradication. Due to experimental limitations, we were not able to test the patients' intragastric pH consistently. Secondly, the effects of amoxicillin during dual therapy on morphological changes of H. pylori may be unrecognized., Studies have shown that amoxicillin at minimal inhibitory concentrations promotes the transformation of H. pylori from a spiral to a coccoid form that is resistant to amoxicillin; the coccoid form contributes to treatment failures and relapses of infection in patients with lower metabolic status. A therapy protocol that can eradicate both spiral and coccoid forms of H. pylori and prevent the occurrence of coccoid forms is needed. In our study, amoxicillin 750 mg four times daily was applied to maintain a minimal inhibitory concentration. However, the morphology of H. pylori was not investigated. Thirdly, H. pylori virulence factors may be involved in the different types of H. pylori-associated diseases and their effects on H. pylori eradication. In Yang et al. 's  study, patients with peptic ulcer accounted for 65% of the total, but only 10% in ours. It is believed that the cure rate for H. pylori infection in peptic ulcer patients is relatively higher than that of patients with other types of H. pylori-related conditions. Formulating treatment protocols based on virulence factors and local antibiotic susceptibility tests may help enhance the efficacy rate of therapy. The eradication rate of the RBAC regimen (14-day bismuth-containing quadruple therapy) in our study was only 84.3%. Other studies in China showed that furazolidone or tetracycline bismuth-containing quadruple therapy could achieve a ≥90% eradication rate., This discrepancy is possibly due to resistance to clarithromycin. It may be that furazolidone or tetracycline should be used in bismuth-containing quadruple therapy. In the present study, the eradication rate of group R10A (10 mg rabeprazole plus 750 mg amoxicillin) was lower than 80%. Thus, it was not considered suitable for empirical therapy. Rather, the bismuth-containing quadruple therapy (RBAC) is still considered the first-line treatment, based on its eradication rate. However, a greater percentage of patients who received RBAC showed side effects such as parageusia, black teeth, and black tongue compared with the R10A or R20A groups. This was due to the bismuth and clarithromycin in the RBAC regimen. Nevertheless, the rate of incidence of adverse side effects and protocol compliance of the patients of the three groups were similar. Due to experimental conditions and feasibility in clinical practice, we failed to monitor the gastric pH value and morphological changes of H. pylori in the patients' stomachs during the treatment, which may have contributed to the undesirable effects. Failure to perform pretreatment tests for antibiotic susceptibility (especially for amoxicillin and clarithromycin) and CYP2C19 polymorphism also made us unable to select appropriate antibiotics and the right PPI dosage. These shortcomings will be investigated and solved through another study in our lab on H. pylori resistance to six antibiotics and the distribution of CYP2C19 polymorphisms in the Chongqing population in China. As high-dose dual therapy achieved a high rate of eradication of H. pylori infection in Taiwan, in this study we evaluated its effects relative to that of a RBAC regimen in mainland China. However, we failed to observe the acceptable eradication rate in the patients with dual therapy. Further studies are still needed to explore the feasibility of dual therapy against H. pylori. Bismuth-containing quadruple therapy is still recommended as the first-line regimen in clinical practice. Marshall BJ, Warren JR. Unidentified curved bacilli in the stomach of patients with gastritis and peptic ulceration. Lancet 1984;16:1311-5. Ramirez RA, Sanchez SR. Helicobacter pylori 25 years after (1983–2008): Epidemiology, microbiology, pathogenics, diagnostics and treatment. Rev Gastroenterol Peru 2009;29:158-70. Beltran-Garcial MJ, Fujii TO. Helicobacter pylori, 13 years after the original publication. Rev Latinoam Microbiol 1997;39:9-31. Gasbarrini G, Racco S, Franceschi F, Miele L, Cammarota G, Grieco A, et al. Helicobacter pylori infection: From gastric to systemic disease. Recenti Prog Med 2010;101:27-33. Cheng H, HuF, Xie Y, Hu P, Wang J, Lv N, et al. Prevalence of Helicobacter pylori resistance to antibiotics and its influence on the treatment outcome in China: A multicenter clinical study. Chinese J Gastroenterol 2007;12:525-30. Gao W, Cheng H, Hu F, Li J, Wang L, Yang G, et al. The evolution of Helicobacter pylori antibiotics resistance over 10 years in Beijing, China. Helicobacter 2010;15:460-6. Wang B, Lv ZF, Wang YH, Wang H, Liu XQ, Xie Y, et al. Standard triple therapy for Helicobacter pylori infection in China: A meta-analysis. World J Gastroenterol 2014;20:14973-85. Xie C, Lu N. Review: Clinical management of Helicobacter pylori infection in China. Helicobacter 2015;20:1-10. Sugimoto M, Shirai N, Nishino M, Kodaira C, Uotani T, Yamade M, et al. Rabeprazole 10 mg q.d.s. decreases 24-h intragastric acidity significantly more than rabeprazole 20 mg b.d. or 40 mg o.m., overcoming CYP2C19 genotype. Aliment Pharmacol Ther 2012;36:627-34. Sugimoto M, Furuta T. Efficacy of tailored Helicobacter pylori eradication therapy based on antibiotic susceptibility and CYP2C19 genotype. World J Gastroenterol 2014;20:6400-11. Sahara S, Sugimoto M, Uotani T, Ichikawa H, Yamade M, Iwaizumi M, et al. Twice-daily dosing of esomeprazole effectively inhibits acid secretion in CYP2C19 rapid metabolisers compared with twice-daily omeprazole, rabeprazole or lansoprazole. Aliment Pharmacol Ther 2013;38:1129-37. Sugimoto M, Furuta T, Shirai N, Kajimura M, Hishida A, Sakurai M, et al. Different dosage regimens of rabeprazole for nocturnal gastric acid inhibition in relation to cytochrome P450 2C19 genotype status. Clin Pharmacol Ther 2004;76:290-301. Sugimoto M, Uotani T, Sahara S, Ichikawa H, Yamade M, Sugimoto K, et al. Efficacy of tailored Helicobacter pylori eradication treatment based on clarithromycin susceptibility and maintenance of acid secretion. Helicobacter 2014;19:312-8. Walsh JH, Peterson WL. The treatment of Helicobacter pylori infection in the management of peptic ulcer disease. N Engl J Med 1995;333:984-91. Thung I, Aramin H, Vavinskaya V, Gupta S, Park JY, Crowe SE, et al. Review article: The global emergence of Helicobacter pylori antibiotic resistance. Aliment Pharmacol Ther 2016;43:514-33. Francesco VD. Mechanisms of Helicobacter pylori antibiotic resistance: An updated appraisal. World J Gastrointest Pathophysiol 2011;2:35-41. Debets-Ossenkopp YJ, Namavar F, MacLaren DM. Effect of an acidic environment on the susceptibility of Helicobacter pylori to trospectomycin and other antimicrobial agents. Eur J Clin Microbiol Infect Dis 1995;14:353-5. Mouton JW, Vinks AA. Is continuous infusion of Mactam antibiotics worthwhile – Efficacy and pharmacokinetic considerations. J Antimicrob Chemother 1996;38:5-15. Zhang W, Chen Q, Liang X, Liu W, Xiao S, Graham DY, et al. Bismuth, lansoprazole, amoxicillin and metronidazole or clarithromycin as first-line Helicobacter pylori therapy. Gut 2015;64:1715-20. Ren L, Lu H, Li HY, Zhu LY, Xu XQ, Gu LY, et al. 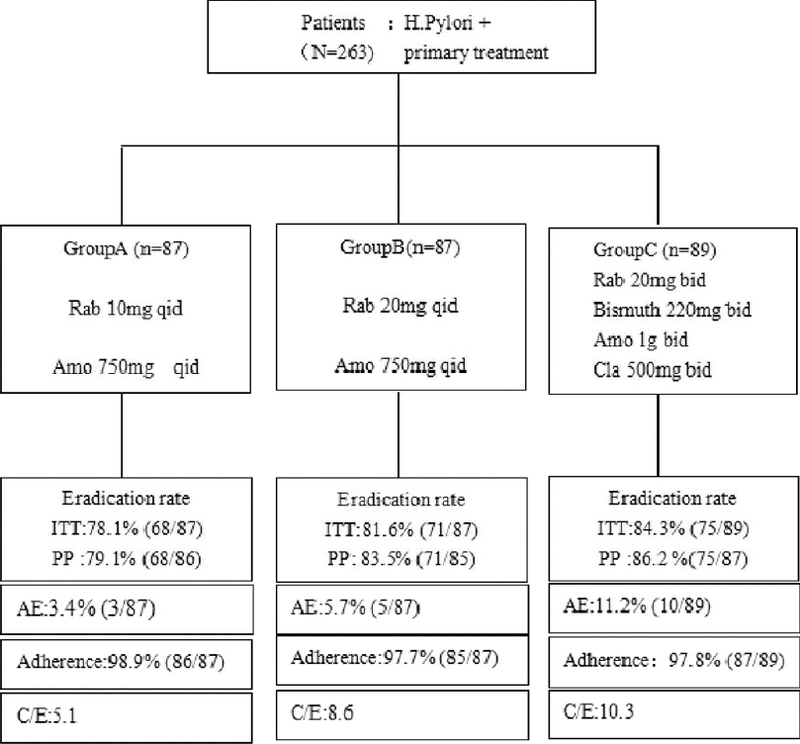 New dual therapy for primary treatment of Helicobacter pylori infection: A prospective randomized study in Shanghai, China. J Dig Dis 2014;15:622-7. Sugano K, Tack J, Kuipers EJ, Graham DY, El-Omar EM, Miura S, et al. Kyoto global consensus report on Helicobacter pylori gastritis. Gut 2015;64:1353-67. Shirai N, Sugimoto M, Kodaira C, Nishino M, Ikuma M, Kajimura M, et al. Dual therapy with high doses of rabeprazole and amoxicillin versus triple therapy with rabeprazole, amoxicillin, and metronidazole as a rescue regimen for Helicobacter pylori infection after the standard triple therapy. Eur J Clin Pharmacol 2007;63:743-9. Sachs G, Meyer-Rosberg K, Scott DR, Melchers K. Acid, protons and Helicobacter pylori. Yale J Biol Med 1996;69:301-16. Han R, Lu H, Jiang M, Tan K, Peng Z, Hu J, et al. Multicenter study of antibiotic resistance profile of H. pylori and distribution of cyp2c19 gene polymorphism in rural population of Chongqing, China. Gastroenterol Res Pract 2016;2016:8547686. Berry V, Jennings K, Woodnutt G. Bactericidal and morphological effects of amoxicillin on Helicobacter pylori. Antimicrob Agents Chemother 1995;39:1859-61. Faghri J, Poursina F, Moghim S, Zarkesh Esfahani H, Nasr Esfahani B, Fazeli H, et al. Morphological and bactericidal effects of different antibiotics on Helicobacter pylori. Jundishapur J Microbiol 2014;7:e8704. Sugimoto M, Yamaoka Y. Virulence factor genotypes of Helicobacter pylori affect cure rates of eradication therapy. Arch Immunol Ther Ex 2009;57:45-56. Liang X, Xu X, Zheng Q, Zhang W, Sun Q, Liu W, et al. Efficacy of bismuth-containing quadruple therapies for clarithromycin-, metronidazole-, and fluoroquinolone-resistant helicobacter pylori infections in a prospective study. Clin Gastroenterol Hepatol 2013;11:802-7. Yang JC, Lu CW, Lin CJ. Treatment of Helicobacter pylori infection: Current status and future concepts. World J Gastroenterol 2014;20:5283-93.